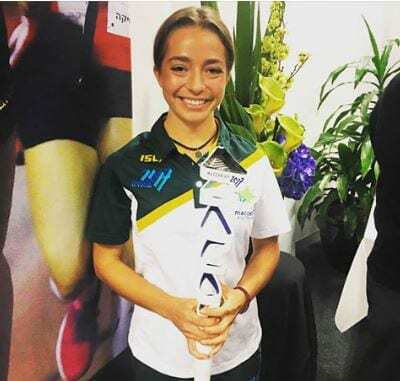 Talented 19-year-old track and field athlete Jemima Montag will carry the Maccabi Australia flag into Teddy Stadium in Jerusalem at the Maccabiah Games Opening ceremony, it was announced at Maccabi Victoria’s farewell on Sunday. Montag, who represented Australia in the 2016 world junior athletic championships in Race Walking and is a national record holder in this event, is an up-and-coming Maccabi leader following in the footsteps of a quintessential Maccabi family. Her parents – Ray and Amanda – met at the 1989 Games, and Jemima will be in a track and field team including her sister Piper, 16, and Andie, 14, is a gymnast. 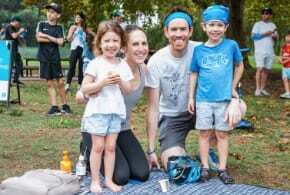 She gave a fabulous speech at the event..
Montag’s honour was announced after cyclist Sean Bloch was named team captain and Australia flag bearer at the Maccabi NSW event a week earlier. Events hosted by Maccabi Victoria and WA over the weekend have completed the farewells for our Australian delegation to the 20th Maccabiah Games in Israel, while also paying a poignant and moving tribute to the teammates lost tragically 20 years ago at the 1997 Games’ Bridge Disaster. Head of Delegation Tom York, who enjoyed a wonderful reminder of the power of the Games when he enjoyed a reunion with his 1969 Maccabiah Games roommates – Henry and Leon Nissesn – at the Melbourne function, beamed at the warmth, buzz and sense of community at the farewells. “It was a magical night,” he said after the Mac Vic event, before attending the function in Perth. 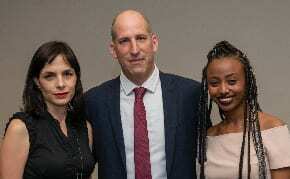 “And to think, there we were, farewelling our biggest delegation to Israel, listening to moving speeches from Josh Frydenberg, Minister for Environment & Energy, who spoke candidly about his memories of 1997, and then Her Excellency Linda Dessau, Governor of Victoria – also Jewish and a Maccabi member in Victoria, was really a great credit to them and our community. 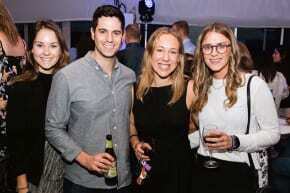 In Perth, over 130 people joined Maccabi WA for a moving and wonderful evening. gave a moving Kaddish which the whole community appreciated. 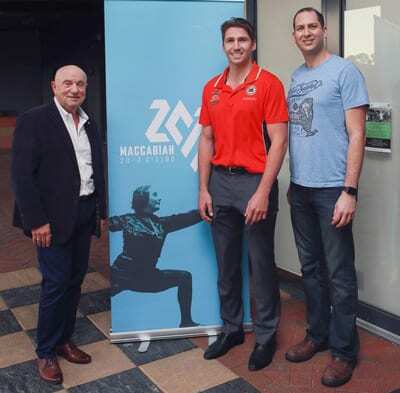 The Perth audience heard from Damian Martin – Captain of Perth Wildcats and Rio Olympian – as a guest speaker giving insights into the last month of preparation for an International Games and life in the Rio Olympic Village. Jemima Montag found the words to express the Maccabiah spirit in her Melbourne address: “The 20th Maccabiah Games are fast approaching, and here we gather as athletes, families, coaches and management staff; excitedly anticipating what will eventuate. Memories to be made, our bodies proudly adorned with the green and gold, determined to push boundaries and strive for our goals at this highly renowned global sporting event. On behalf of the athletes, I would like to extend a very warm thank you to all members of senior management as well as sport team managers and coaches for the exceptional organisation, persistence and energy that they have dedicated over the past months, to get this incredible Australian team to where we are today, and where we are going to be very soon. My memories of the 2013 opening ceremony are still so vivid, and I feel overwhelmed with excitement to be carrying the Maccabi Australia flag into the Opening Ceremony this year behind the team captain Sean Bloch. Sporting championships such as the Maccabiah Games are, by their very nature, driven by dreams of achieving goals. In chasing your aspirations in Israel, never lose sight of the journey surrounding them. From the way you felt the day you learned of your Maccabiah selection, to the sense of accomplishment upon completing winter training sessions in the rain in Melbourne, the beginnings of team bonding, and the anticipated sense of pride and exhilaration when you walk into the opening ceremony in your Australian uniform. Your individual journeys to get to this point inspire all of us- the months of research, making training plans with coaches, the sacrifices, challenges, risks, teamwork and picking ourselves up from set-backs and injury. I would like to inspire everyone to unite as one Australian Maccabiah Team. At the airport and during pre-camp, introduce yourself to someone from another sport, someone who isn’t your age or perhaps seems different to you in a fascinating way. My parents met in this exact way at the 1989 Maccabiah Games and gosh am I thankful for it. If you have down-time, go along and support your new friends from other sports, sit with someone new at meal times and find out about their journey to the games. 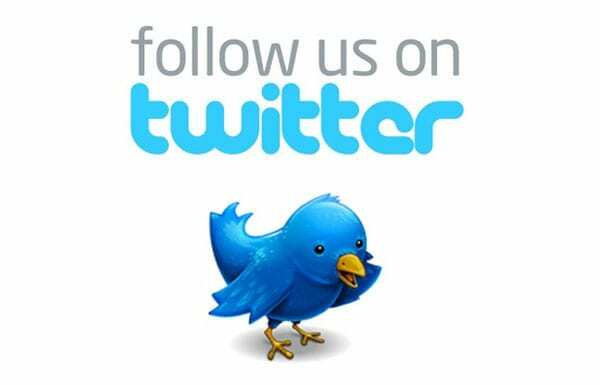 Embrace the social media posts and keep yourself updated on the results of all sports. Show your wider Australian teammates the support and respect that you’d like to receive in return and we can, and we will achieve something really special. These Games offer us the opportunity to forge lifelong friendships, with people who are connected on many levels, often beyond their specific sport. The 3 functions were a fitting tributes to the deceased & injured in the bridge tragedy of 20 years ago. Additionally , they were a wonderful send off for the 574 athletes in the Australian Team for the 20th Maccabiah. May the team be successful & return safely . Parliament of Iran building and the later Ayatollah’s tomb was attacked by gunmen today.